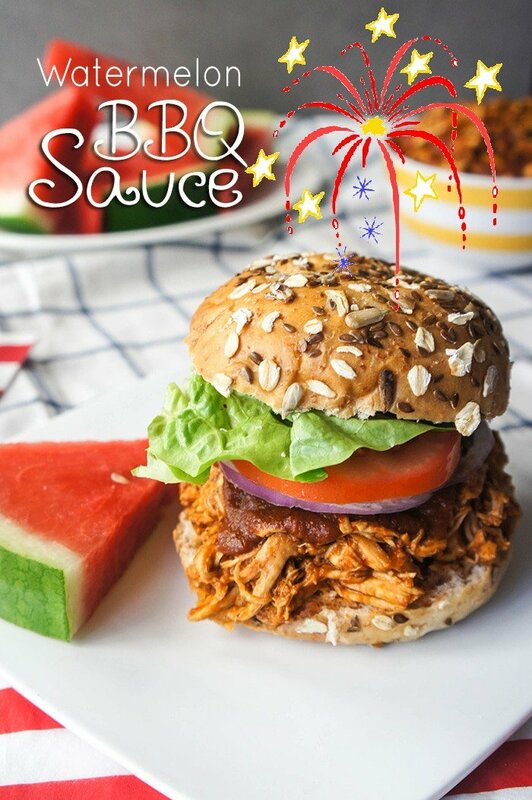 Watermelon BBQ Sauce + Happy Labor Day AND Merdeka Day! 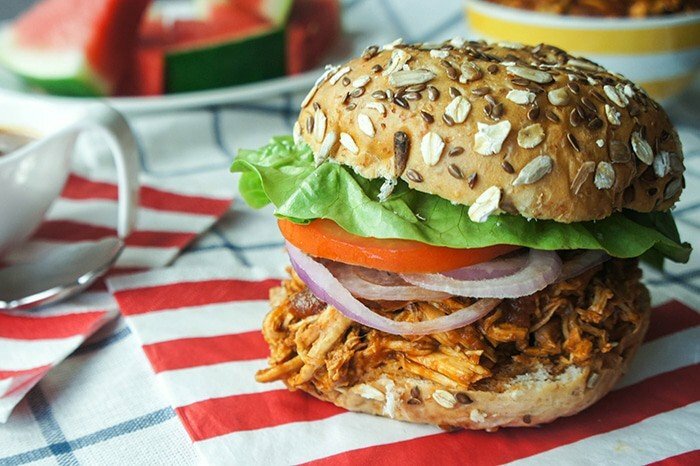 A perfect day to post this very festive watermelon BBQ sauce recipe- a 3 day weekend in both the States and here in Malaysia! Happy Labor Day, Americans. And in Malaysia, it’s Merdeka Day. Merdeka is Malaysia’s “Fourth of July,” a celebration of it’s independence from colonial Britain in 1957. It’s been a quieter, more reflective Merdeka weekend in Kuala Lumpur this year. (Side note: I love Google! This is what Google looks like in Malaysia today- hibiscus is the national flower). Last Friday (August 22nd) was called a National Day of Mourning here in Malaysia, in respect for the victims and families of flight MH17. That day, the remains of the some of the victims from the crash were brought back to Malaysia for burial. In light of the tragic events of both MH17 and MH370, the government here canceled fireworks and toned down normal festivities, in respect to the families. Very fitting in light of how many Malaysians have lost their lives this year in random accidents. I live across the street from the National Palace, and I can hear a marching band playing down there right now. 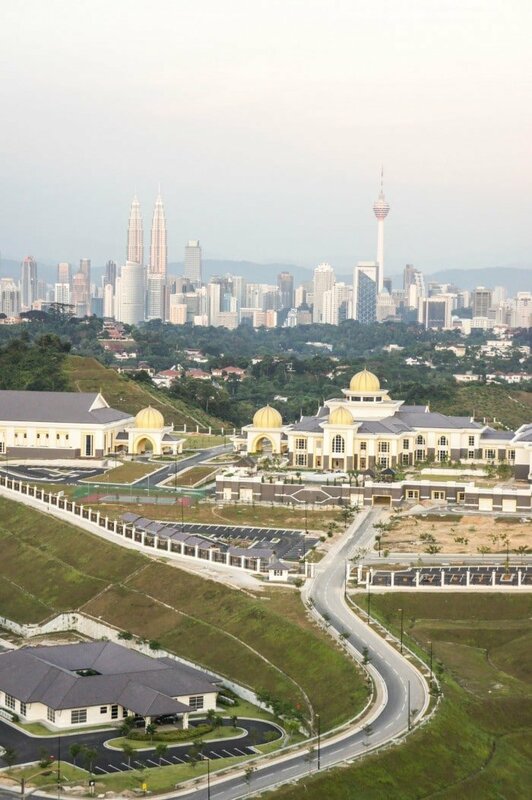 (View from my balcony of the palace and the Petronas Twin Towers– this was taken while the Palace was still under construction). Labor Day is officially the end of summer in the States. Schools are back in session this week! (I can hear cheering from crowds of parents through my computer). This BBQ sauce would be equally good if you’re grilling. I used it to slow cook some chicken breasts, and shred them. I made the (beautiful) chicken sandwich for Alex, and ate mine on crunchy leaves of romaine as wraps with tomato and avocado added. Now, watermelon BBQ sauce isn’t just watermelon. There’s still tomato paste. 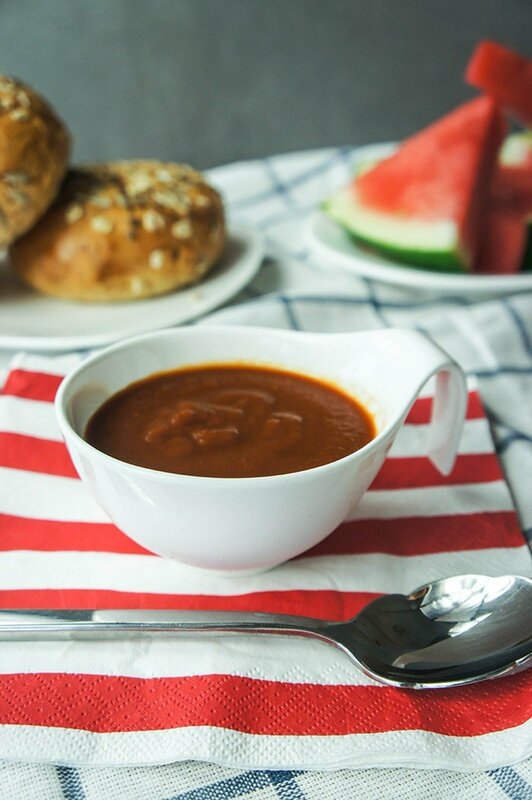 At least this watermelon BBQ sauce (and many others I’ve seen recipes for!). I had watermelon BBQ for the first time years ago at Salty’s on the Columbia in Portland. It was served with grilled halibut. Normal BBQ sauce would be too sweet and cloying for the light flavors of halibut, but I remember how perfectly suited the lighter bodied watermelon BBQ sauce was for the fish. 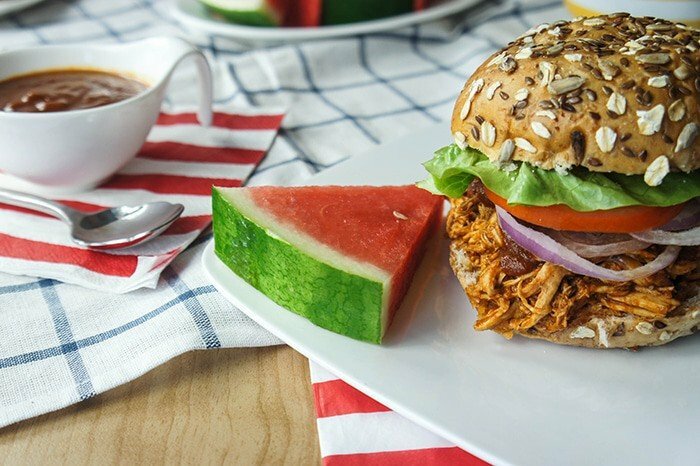 What I really love about this BBQ recipe is that because the watermelon is so sweet, I barely had to add any sweetener. I added a bit of molasses, and after tasting it, couldn’t imagine it needing any more sweetness. I experimented with several different types of vinegar, and found the lightness of champagne vinegar worked the best at keeping this a light and fruity sauce rather than overpowering it. This BBQ sauce would be a great healthy dipping sauce- for baked chicken fingers, or even sweet potato fries! A lightly sweet, fruity BBQ sauce, perfect for chicken or fish. Add olive oil to a large pot, and saute onion for 7-10 minutes, until translucent and lightly browned. Add the cubed watermelon, tomato paste, and water. Bring to a boil, and then reduce heat to medium low, and continue to simmer for 45 minutes. Pour mixture into a blender, and process for 2-3 minutes, until the mixture is really smooth. Return to pot, and add remaining ingredients. Simmer for another 20 minutes, stirring occasionally, until the mixture has slightly thickened. In a skillet, add olive oil, and then brown both sides of the chicken over high heat. Season with sea salt. 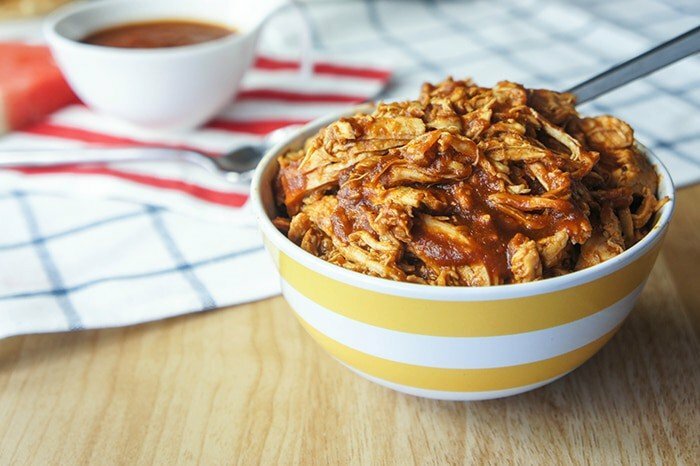 Add browned chicken and BBQ sauce to a crockpot. Cook on high for 2 hours, or on low for up to 4 hours. Remove the chicken breasts, and shred using two forks. Return the chicken to the pot, and mix well with the BBQ sauce. I added extra vinegar to the final BBQ recipe to give it more of a kick when cooked in to the shredded chicken. Consider adding only 2-3 tablespoons of vinegar if planning to use it as a dipping sauce. The cherry version looks amazing! I will have to try it when I'm in Oregon next summer, where cherries are plentiful. It would be very expensive BBQ here in Malaysia where I live! I am too late to make this for labor day but I think that would be a great any day dinner. I can put this is my crock pot at lunch and go back to work and have dinner ready when I get home. My kind of meal. Can't wait to try it out. Yes, I love those kinds of dinners for midweek too! I need to come up with more of them. I love to cut up veggies, keep them in a zip lock bag, and when I get home from work, I just pour them on the top to steam for 20-30 minutes before it's time to eat.